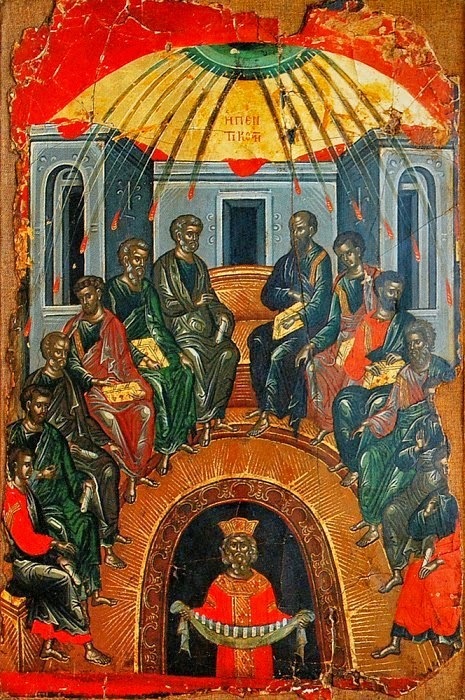 One of the most interesting traditions of Byzantine iconography is the kind of Pentecost icon seen here. All four of the Evangelists are included among the Apostles, as is St Paul, even though Mark, Luke and Paul were not present at Pentecost. (They are the five shown holding books.) This demonstrates that the Holy Spirit continues His mission in the Church even after the day of Pentecost itself. The other Apostles are holding scrolls, representing their role as the Church’s teachers. The figure below, an aged king with a crown, represents the World, grown old in sin and idolatry, living in darkness. In the cloth in his hands are scrolls, which again represent the teaching of the Apostles, by which he will receive the preaching of the Gospel and the renewal of the Holy Spirit. Νῦν περιβάλλονται κράτος οἱ Χριστοῦ ἀφ’ ὕψους Ἀπόστολοι· ἐγκαινίζει γὰρ αὐτοὺς ὁ Παράκλητος ἐν αὐτοῖς καινιζόμενος, μυστικῇ καινότητι γνώσεως, ἣν ταῖς ξέναις φωναῖς καὶ ὑψηγόροις κηρύττοντες, τὴν ἀΐδιον φύσιν τε καὶ ἁπλήν, τρισυπόστατον σέβειν τοῦ εὐεργέτου τῶν ὅλων Θεοῦ, ἡμᾶς ἐκδιδάσκουσι· διὸ φωτισθέντες τοῖς ἐκείνων διδάγμασι, Πατέρα προσκυνήσωμεν, σὺν Υἱῷ καὶ Πνεύματι, δυσωποῦντες σωθῆναι τὰς ψυχὰς ἡμῶν.